The Markets Are Coming! The Markets Are Coming! I wasn't looking forward to going. It was a week night, and it would have been nice to stay home and hang out with the family, have dinner, maybe watch a movie. But my friend Susan was meeting me, and I sighed heavily so everyone would know I was only going because I had to. But once Bryant Terry walked out and opened his mouth, I was glad I came. A former graduate student in history studying social movements of the 60s, he eventually stumbled across references to the Black Panther Party. The food programs the Panthers ran in black urban neighborhoods were revolutionary at the time, centering around issues of food justice, with grocery giveaways and free breakfasts for poor children. His own grandparents were from a rural area of Tennessee, and brought their rural food traditions with them when they moved to Memphis. This included vegetable gardens covering every inch of yard that fed not only their family but provided goods for bartering with the neighbors. 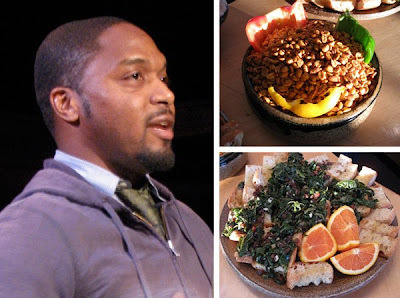 It was a tradition rich in community and bolstered by sharing food, and his interest in hip hop, the social efforts of the Panthers and educating people about healthy eating came together when he left the graduate program to enroll in culinary school. He sees cooking as a way to bring people together to build communities around good food and quotes freely from Anna Lappé and Alice Waters. His new book, Vegan Soul Kitchen: Fresh, Healthy, and Creative African-American Cuisine, is an imaginative take on the traditional cookbook, not only because of its updating of traditional soul cuisine, but because he also includes suggestions of music to listen (and dance!) to while you're making the food. And I know that I, for one, will be looking forward to listening to more of what this young man has to say in the future. 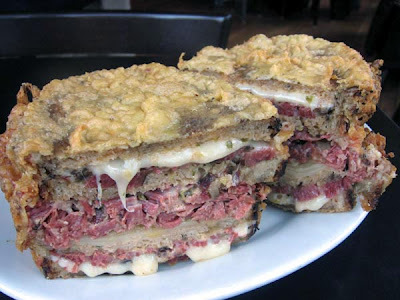 "That, my friends, is a DDD reuben—as in triple-decker. In the middle is the standard lovely reuben with 9-10 ozs. of house-made pastrami, two slices of Swiss, Russian, and kraut. On top and bottom is another reuben, each with about 4 ozs. of pastrami and two slices of Swiss cheese. That's over a pound of pastrami, 1/4 lb. of swiss cheese and a whole bunch of creamy Russian all grilled together into a delicious mess. And as if that wasn't a cholesterol bomb waiting to explode in your heart, we went ahead and battered and deep-fried it. Hey, what can I say, we like to have some fun once in a while." You can take a look at the process of creating this masterpiece/monstrosity here. And by the way, they're not planning on putting it on the menu, but it will be offered one day only on Wednesday, April 1. Details: Kenny & Zukes, 1038 SW Stark St. 503-222-3354. The mention of miner's lettuce (claytonia perfoliata) in Jim Dixon's most recent post got me drooling in anticipation of the fleeting green delights to come...favas, pea shoots, spring peas, asparagus and so many more. We spent our weekend up at the yurt. Spring at the east end of the gorge brings a vivid blast of green to a landscape that’s beautifully muted most of the year. It also means we’ll find the tender, near-succulent leaves of miner’s lettuce, a member of the purslane family, under the clusters of Oregon white oak. Right now they’re more like tiny micro greens, but we still picked enough to add to a simple salad of chopped Romaine drizzled with Madre Terra extra virgin olive oil and a splash of Katz Late Harvest Sauvignon Blanc vinegar. But most of the produce available still looks back to the colder months. Along with the salad, we had brussels sprouts. 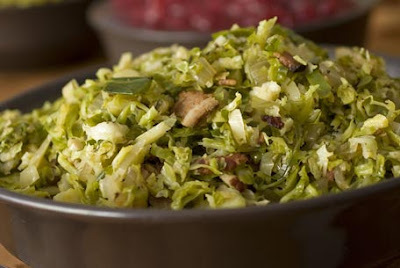 Coarsely chop a pound or so of brussels sprouts and a walnut-sized shallot. Cook them together in a healthy glug of extra virgin olive oil with a good pinch of sea salt until just tender. Add a splash of good vinegar or a squeeze of lemon or lime. Just think of it. If Proust had grown up in Mexico and his mother had offered him, instead of a cup of tea and a madeleine, a warm tortilla fresh from the comal. And a small bite of it had brought back a single, happy memory of the tortillas his beloved aunt had made for him as a child. Would a "Remembrance of Things Past" that conjured a Mexican village instead of a French one, with "its surroundings, taking shape and solidity," have affected the history of literature as it did? For me, all it takes is the aroma of warm corn tortillas, or a whiff of the sharp citrus scent of a freshly cut lime to bring back memories of Mexico, of a beach at sunset, a line of palm-roofed palapas illuminated by candles flickering in the warm breeze off the ocean. 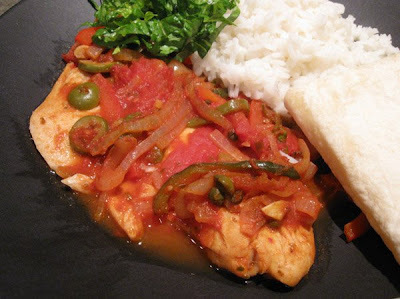 It was at just such a place in Puerto Vallarta, Mexico, that I had Veracruzana, a dish made with the local fish called huachinango. Quickly cooked in a sauce of chiles, green olives and tomato, then brought to the table and scooped up with fresh tortillas, it instantly rocketed to the top of my list of most-ordered menu items. And it's become a big favorite here at home when its cold and rainy and we need a reminder of more tropical climes. Heat oil in skillet over medium heat and sauté onions, garlic and peppers till tender. 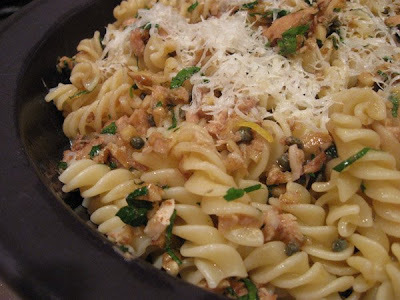 Add bay leaves and oregano and sauté 1 min., then add tomatoes, capers and green onions. Simmer 1/2 hour. Meanwhile, heat olive oil in another skiller. Brown snapper on both sides and transfer to 9" by 12" baking dish. Pour tomato sauce over top and bake in 375° oven for 15 minutes. Serve with rice, fresh tortillas and green salad. Grateful isn't the right word. And neither is thankful. Blessed comes close, though I'm not particularly prone to using religious analogies. But what else can I say about the people who've been so supportive of this science experiment, my attempts to learn to write? You've stuck with me through the silly and the profound, the ups and downs. So this year I'm dedicating myself to giving back to you. 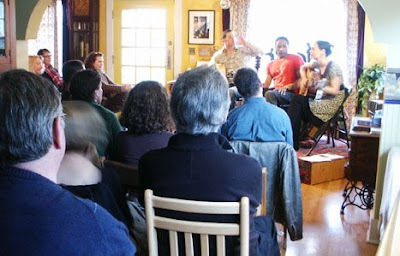 First up is a discount on tickets to Matt Miner's Hollywood House Concerts for GSNW readers. Matt and his wife, Sasha, host music concerts in their home and have started working with the folks at Blackbird Wineshop on NE Fremont. Matt is offering GoodStuffNW readers a discount on a pair of tickets to the April 11th show featuring New York jazz singer Kendra Shank with phenomenal guitarist John Stowell. The clincher is a special appearance by legendary jazz vocalist Nancy King. For only $50 for two (regularly priced at $60 for the pair), you get up close and personal with these nationally known musicians, accompanied by a selection of desserts from Sasha. Wine is available for purchase from the shop to make the whole evening even better! Details: Kendra Shank, John Stowell and special guest Nancy King in concert. April 11, 8 pm; $50 for two. E-mail Matt to reserve your tickets. 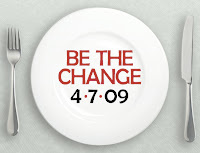 And if you vote for my post on Culinate.com before noon on Tuesday, Mar. 31, you could help GSNW win a signed pre-release copy of Deborah Madison's new book What We Eat When We Eat Alone that I'll give away in a future drawing. So both of us can win! Yup. That's him. Watching a ball game and drinking a beer. According to an article in today's New York Times, he went to a (Chicago, of course) Bulls/Wizards game recently. And he and Michelle have even (gasp!) dined out at Washington restaurants like Equinox, Bobby Van's Steakhouse and other spots not normally associated with presidential appearances. Whose cockamamie idea was this, anyway? Doesn't he know that a president isn't supposed to venture outside the bubble that is the White House with its sycophantic, self-referential babble? And how welcome a sign is that? 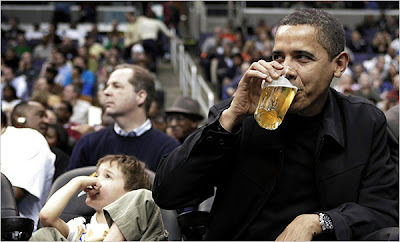 More to the point, even: What beer is he drinking? On Tuesday, April 7th, you can join Mercy Corps and your neighborhood restaurants in their wish for a world that is free of suffering, poverty and oppression. Dine at any participating establishment and 25% of your bill will be donated to Mercy Corps to change the world for the better. The list of participating restaurants is growing all the time, so mark the date on your calendar and check the Dine For Mercy Corps website for the latest updates. Details: Dine for Mercy Corps. Tues., Apr. 7. List of participating establishments on the website. Join 50 restaurants, 20 wineries and four breweries in an effort to help end childhood hunger at this year's Taste of the Nation celebration. It's happening on Monday, April 27, at LUXE Autohaus in NE Portland, and it's sure to be a party with a MIXology station featuring a rotating cast of some of Portland's most creative bartenders, emcee and no slacker with a shaker herself, Lucy Brennan of Mint and 820. Tickets are limited, so get yours now. Details: Share Our Strength's Taste of the Nation. Mon., Apr. 27, 6:30 pm; $75 general admission. Tickets available online or call 1-877-26TASTE. During the month of April, Portland's own Hotlips Pizza is passing out free packets of wheat seeds to anyone who comes into any their five Portland-area pizzerias during the month of April (while supplies last). They have 2,000 seed packets to give away. 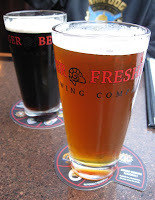 The seeds are Tara red spring wheat from Shepherd's Grain Cooperative in Washington State. Says David Yudkin, co-owner of Hotlips, "This weekend is the sixth anniversary of the US war with Iraq, so we thought it was timely when our wheat farmer, Karl Kupers, handed us a sack of wheat seed from last season's crop, ready to plant." Details: Free Wheat Seeds from Hotlips Pizza. All of April while supplies last. Check their website for locations. "It was my gateway drug; you know how it is. I was away at college and a supplier down the street offered high-quality product. After I'd had it once, there was no going back." 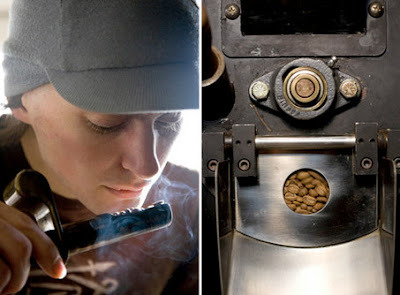 Read my article about Portland's new breed of coffee roasters in this month's MIX magazine! 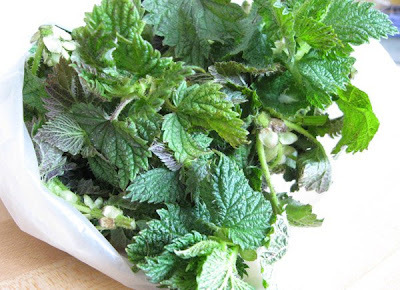 "Nettles are fantastically high in vitamins A and C, and rich in nutrients, including calcium, choline, magnesium, boron, iron, iodine, silica , sulfur, potassium, chlorophyll, histamine, serotonin, glucoquinones, bioflavonoids, tannins and amino acids. They're unusually high in protein (40%) for a plant." "These are a great and healthful green to eat, but they are only eaten cooked. Take care when handling, they will sting while raw. It takes very little cooking to shed the stinging." I think that qualifies them as "extreme food." They were eventually going to be the main ingredient, along with a couple of leeks from the farmers' market, in a tart I was making for an appetizer, and serving it with my hands wrapped in gauze would probably be less than appetizing for my guests. So I donned my (brand-new) gardening gloves, dumped the bag of nettles into the colander, gave them a good rinse and then transferred them into a hot skillet to wilt. After they cooled, and without the gloves, the big stems were removed and the (now stingless) leaves were picked off. Basically tasting like spinach or fiddlehead ferns, I chopped them, squeezed out the water that remained and added them to the tart. And I mean, how many times do you get to tell a story about risking your safety for the pleasure of your guests? So worth it! For filling: While dough chills, chop garlic, slice leeks and mushrooms and grate cheese. Melt 1 Tbsp. butter in skillet and add garlic and leeks. Saute till wilted, then add mushrooms and saute till golden, about 10 minutes. Mix in thyme and cool. 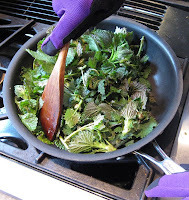 Wearing thick gloves, dump nettles into colander and rinse. Melt 1 Tbsp. butter in skillet and add nettles, cooking until nettles are wilted and most of the water they release has evaporated. Drain in colander and cool. Remove larger stems if desired and squeeze out water, then chop coarsely. Sprinkle cheese in crust. Cover with vegetables. Whisk cream, yolks and eggs in bowl and pour over ingredients in crust. Bake until filling is set and top is golden, about 30 min. Serve immediately or cool on rack. It was early on a Saturday morning. Sitting at the kitchen counter, drinking my coffee and reading the paper, the idea of getting dressed, much less heading out into the cold morning, was distinctly unappealing. For the optimists, bedding plants galore. But once I got there and saw the gathering of tents, the first of the morning's shoppers with their bags starting to bulge with purchases and then got wind of the smoke from Tastebud's wood oven, I knew it had been worth coming. There's something about the first markets of the season that draw me, whether it's the promise of spring they bring or watching people's expressions on seeing the very first green things of the season piled high on vendors' tables. No matter the weather, pasta is always appropriate. I'd heard there might be protests over the banning of dogs at the markets on the Park Blocks, but no sign-wielding, poop bag-hurling dog owners were in sight. Maybe because no one could be cranky as the sun broke through the clouds and bathed the stalls in its early morning light. Eventually my bag filled with arugula, nettles (see accompanying post) and paté, along with Fressen's dense, nutty rye bread and the Happy Chickens ladies' fresh eggs. What can I say? With all this goodness available, why would anyone stay home? 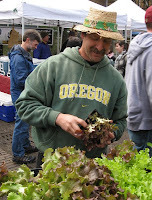 Details: Portland Farmers' Market at PSU. Sat., 8:30 am-2 pm. At Portland State University in the South Park Blocks between SW Harrison & Montgomery. 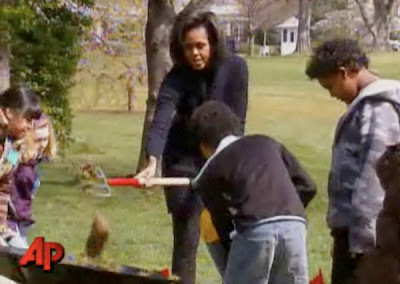 "With the help of local elementary school students, Michelle Obama broke ground for a White House garden and initiated a public campaign to help Americans better understand where their food comes from." While I read that Laura Bush insisted that organic foods were served at the White House to her family, she never bothered to share that with the nation. Is anyone else as excited as I am about how different things are now? Though we've had a couple of seductive days of near-60° weather here in the northern Willamette Valley, it's still a long, drawn-out slog till good weather comes to stay. But you gotta eat, right? And savoring those last few cold weather vegetables almost makes you miss them before they're gone. (Yeah, right...) Jim Dixon of Real Good Food shares his recipe for a New Orleans classic. The foods of early spring might trigger anticipation of the coming bounty, but produce reality means I’m still eating lots of cabbage (not that I’m complaining). Celery root is another winter favorite of mine, and I just pulled one out of the vegetable drawer that I bought at the December farmers market (the things will obviously keep for awhile). 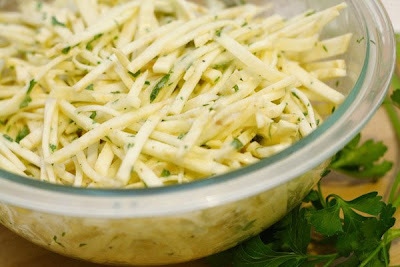 I wanted to try out my new Zyliss julienne cutter (it looks like a swivel peeler, but with a row of teeth), so I made my version of remoulade. Strictly speaking, remoulade is a mayonnaise based sauce with herbs. My version uses a little mayo, but offers a hat tip to New Orleans, where remoulade is usually tomato-based and served with shrimp, with a little bit of Crystal, Louisiana’s favorite hot sauce. You can eat this as a salad, alongside fish or meat, or pile it on a sandwich. Peel the celery root (I use a heavy knife and slice off the outer layer) and cut into julienne (you can also grate, tho’ the texture will be different, or cut into thin matchsticks by hand, which will take awhile). Mix a couple of tablespoons of Katz Gravenstein Apple Cider vinegar* with a little sugar (about a tablespoon) and a healthy pinch of sea salt (for cooking I use the fine Sal Marinho Tradicional from Necton, and I’ll have a few bags on Saturday at the Portland State University farmers' market). Stir in about twice as much extra virgin olive oil (about a half cup), a couple of tablespoons or so of stone ground mustard, a few shakes of Crystal (substitute with a similar vinegar-based sauce like Frank’s or use a bit less Tabasco since it’s hotter), and, if you like things a little creamier, a bit of mayo. Combine the celery root with the dressing and let sit for at least 20 minutes (if you can wait that long). Serve. * Jim informs us that, though it isn't listed on his website, he usually has the Katz vinegar in stock. E-mail him if you want some. 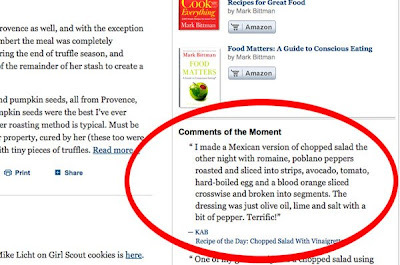 Not to get all tooting-my-own-horn here, but a comment I made on Mark Bittman's blog Bitten has just been singled out for the second time. Woo hoo! Chrissie and Koorosh Zaerpoor have been thoughtful stewards on so many levels: farmers, landowners, parents, educators, cheesemakers and community members. 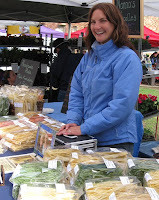 This year brings much change to Kookoolan Farms, including a move away from regular participation in the Hillsdale Farmers' Market in order to focus on their farm store in Yamhill, where they will offer cheese classes, sell cheesemaking supplies and eggs and devote energy to a nascent CSA. It also gives an opportunity to develop a more natural, comprehensive system for raising poultry meats, which Chrissie reflects on here. There has been substantial media focus on the rapidly-reducing number of species and varieties of foods available to humans. A huge amount of our own species' calories comes from just corn, soy, wheat and rice. 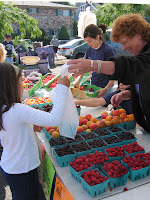 Within these plant species, genetically modified varieties exist for all four, and a number of natural and heirloom varieties suited to particular climates, resistant to particular diseases and possessing certain characteristics that were valued by the people who selected them (such as flavor, color, and nutrition) are either lost or threatened. It is the same for livestock breeds. Modern domestic breeds of cows, pigs, chickens and turkeys are bred for rapid growth and docile temperament. Older breeds that had been selected for high butterfat, good mothering skills, excellent taste, hardiness in certain climates and strong immune systems are rapidly going extinct. Nearly all of the chickens that we raised in 2008 were Cornish Cross chickens. 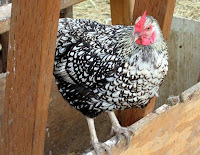 These are the same broad-breasted chickens that are raised by virtually everyone in America; exact statistics are hard to come by, but well over 90% of all American chickens are Cornish Cross. By the early 1950s, more than two-thirds of all commercial chickens in the United States carried the bloodlines of the winners of the "Chicken of Tomorrow" breeding contests of 1948 and 1951. [watch this amazing video about the contest - KAB] The poultry breeder who placed second in the contest developed the hybrid chicken: female and male breeders are bred separately for different characteristics, and then bred together for egg and chick production in confinement factories. 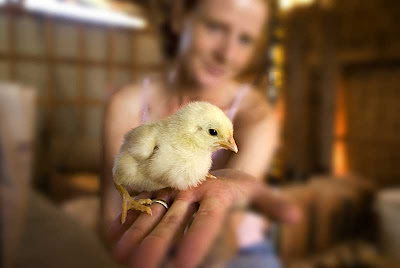 The hybridization ensures that second-generation chicks will not produce good meat chickens, guaranteeing buyers for the hybrid chicks just as sterile seeds from Monsanto guarantees seed buyers. Commercial broiler chickens today grow to twice the finished weight in less than half the time and on less than half the feed, compared to chickens available in 1935. Summarized another way: prior to the hybridization and industrialization of the poultry industry that began around 1935, the natural growth pattern of a meat chicken was a 16-week growth period to a finished carcass weight of less than three pounds. Rapid growth in modern chickens has come at the expense of the birds' immune systems, resulting in weaker legs, more heart attacks, green muscle disease and the need for antibiotics and medications to prevent large-scale outbreaks. Koorosh and I are having ethical struggles with nearly every aspect of what we've outlined here. The delicious irony is that preserving these heirloom animal breeds requires both raising them and creating a market that demands these meats. Older breeds of chickens have far better immune systems, and they are physically able to reproduce naturally. Is it possible to grow an older breed of chicken, have our own flock reproduce naturally, raise the birds to the natural mature age of 16 weeks and market a 3-pound bird profitably? This is an experiment best done on a small scale, and not with the volume of birds we raised in 2008. Photos of chicks (top) and egg-washing (upper left) by Frederick Joe, the Oregonian. We've all heard about the turmoil in the print industry lately, with budgets being slashed and papers shutting down. Our own Oregonian is reining in budgets but, knock on wood, is still on the stands. With downsizing come budget cuts, and I've just been told that FoodDay is reluctantly having to cancel my Market Watch column for this season. 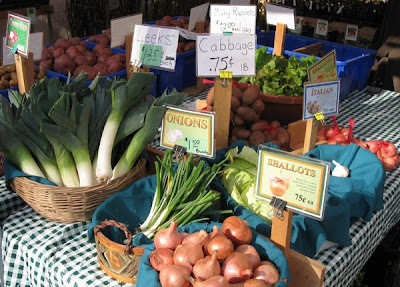 Instead, staff writer Grant Butler is going to do a regular feature about interesting produce at the market, with a focus on what's in season and how to prepare it. 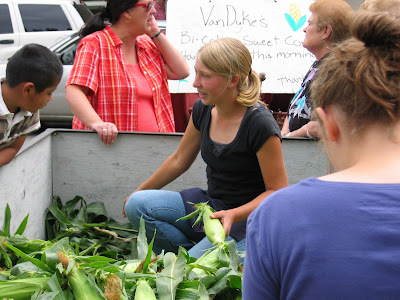 And you'll still be able to read about the markets right here on GoodStuffNW, with a survey of the farmers and bounty that make our corner of the universe such a wonderful place to live. With that in mind, I'm interested in hearing from you about your local markets and what's kicking your "on button" as the season progresses. Shoot me an e-mail if you'd like to be a contributor (from anywhere in the Northwest)! In our house, my dad loved his French Colombard and Chablis. His wine preferences ran toward the boxed, those spigoted dinosaurs that lived on the top shelf of the fridge and screamed "cheap" and "sweet." But these days, I'm here to tell you, there is a plethora of excellent, and I mean fit-for-fancy-dining, box wines. From France and Spain and other countries known for their expertise with the grape, box wines have hit the wine glass running. Even well-known vineyards in Europe are jumping on the cardboard bandwagon, cutting back on their use of glass bottles, labels and corks without sacrificing the quality of their product. Each box contains three liters or the equivalent of four bottles of wine and can cost less than $30, a real bargain for your budget. And articles and websites from the New York Times to Treehugger are touting its green bona fides. I like the box because I don't have to open a whole bottle in order to have a glass of wine with dinner, and since an open box can stay fresh for weeks, I don't have to worry about the wine going off. 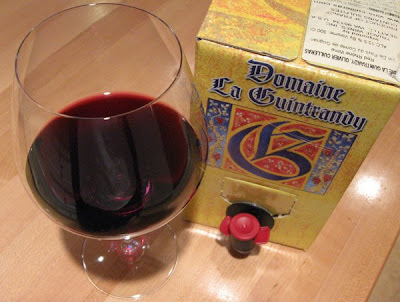 So if your local wine purveyor doesn't carry at least one box wine, ask him to consider it. Then just pop the spigot, pour a glass and toast your new cardboard friend. A friend once described me as a geographic void. That's because I've never been able to remember if Kentucky is north or south of Tennessee, or the order of those teeny tiny states on the Eastern seaboard. And let's not even bring up the Midwest, okay? I have the same problem with cuts of meat. Yes, I've seen (and even tried to memorize) that diagram of the cow that looks like a map, with the state of flank in a perpetual border dispute with brisket, and top and bottom round arguing over positions at the negotiating table. But I've learned that no matter where they're located, the best way to learn about cuts of meat is to eat them. 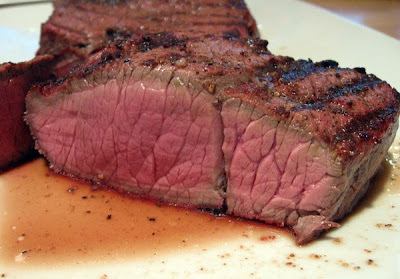 Which is how we discovered the top round (often referred to as London Broil, which is actually a preparation, not a cut of meat), beautiful red hunks of meat more than an inch thick sitting right next to the steaks in the meat case. It's a very lean cut, with almost no marbling, and the price, usually below $4 a pound, made me leery of its ability to perform on the grill. But since Dave was in the mood to 'cue and the week's grocery budget was a little thin, we decided to give it a try. And we're so glad we did. A hot fire, about eight minutes over the coals with only salt and pepper as seasoning, and this baby was good enough for company. The flavor reminds me of hanger steak, with a deep, beefy taste, and the texture is tender enough to cut with a table knife, dense without being tough, and even though it's not fatty it has plenty of juice. So if you want to venture outside your usual boundaries and have some good meat without busting your (very) local economy, give the top round a try. Who knows where the journey might lead? Look for other recipes in the Budget Cuts series: Stuffed Pork Leg Roast with Kale and Pine Nuts; Chile-Marinated Pork Shoulder; Pork Tagine with Pistachios, Almonds, Pine Nuts and Golden Raisins and Pork Leg Roast with Lemon and Prosciutto Stuffing and Roasted Vegetables. It seems so natural. Our favorite people introduce us to our favorite places. Like several years ago when our friend Joel Weinstein heard we'd never had the Vietnamese soup called phở. Instead of shaking his head in disbelief or scoffing at our ignorance, he immediately took it upon himself to shepherd us through the jungle of beef tendon and bible tripe on the menu and watched as our eyes widened at our first slurp of its deeply simmered perfection. Ever since, when I've heard whispers of amazing noodles at little joints secreted away in some pocket of the city, I put on my best Indiana Jones and go searching for the holy grail of the perfect bowl of phở. 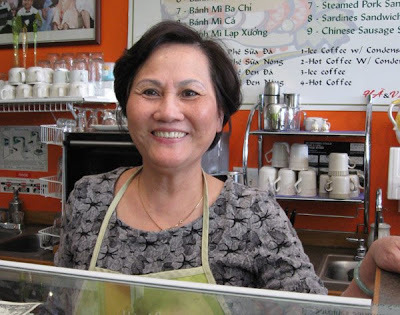 So when an adventurous friend who loves good Vietnamese soup as much as I do wanted to meet for lunch, I suggested Ha & VL, a spot I'd read about on my brother's blog and that was touted by the Oregonian's Karen Brooks last September as "the find of the summer." Located in the courtyard parking lot of Wing Ming Plaza, which has to be the best name for an Asian strip mall on the planet, on SE 82nd Ave., this tiny jewel reflects the cheery brightness of Ha Luu (top photo), the smiling face behind the counter and the genius behind the stunning concoctions on the menu. You can take my word for it, this bright spot is not to be missed. And it might just become one of your favorite places. I know Joel would have loved it. Details: Ha & VL, 2738 SE 82nd Ave., #103. Phone 503-772-0103. Some might feel the need to travel to an exotic location, climb to the top of a mountain and find out from the guru who lives there that life is a wheel and what goes around comes around. I learned that lesson growing up by sitting down to dinner. The mis en place, appealing to my inner OCD self. Sunday was chipped beef on white bread eaten on TV trays while we watched Walt Disney's Wonderful World of Color. Monday was some form of hamburger, whether patty, meatloaf or cooked with rice and tomatoes and called Spanish. Friday was tuna casserole made with the glue that held so many mothers' culinary universe together, Campbell's cream of mushroom soup. Around here it's not quite that predictable, but there are dishes that make a regular appearance on our dinner table. So when I'm not feeling particularly creative, like my mother I boil water for pasta and open a can of tuna. But instead of reaching for the Campbell's, I sauté a little garlic, toss in some lemon zest and capers, sprinkle on some parmesan and, like Mom, call it dinner. Boil water for pasta. Add salt and pasta and cook till al dente. While pasta is cooking, heat olive oil in medium skillet and sauté garlic briefly. 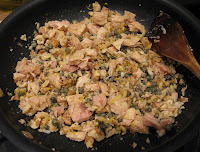 Add walnuts, tuna, capers and Worcestershire sauce and sauté till warm. Turn off heat and stir in lemon zest, parsley, lemon juice and salt and pepper to taste. When pasta is done, drain off water, place in bowl and pour tuna mixture over top. Sprinkle with 1/4 c. of parmesan, reserving remainder to add at the table. There are those obligatory trips you take. Family takes up most of the category, with weddings, anniversaries and, of course, funerals. Though not as momentous as those, this trip was back to Salem where Dave had a long work weekend. So I booked a room at the Phoenix Grand Hotel where we'd stayed before, located downtown with decent rates and nice rooms. And since Dave had the car, I thought I'd book a rental for the drive down, but when I found out it would run $160-180 bucks for the hour trip from Portland, I quickly got creative. Fortunately, since I had my fill of Greyhound in college, a company called HUT Airport Shuttle offers regular service from PDX to Corvallis several times a day, and was only $35 for the trip to Salem. The buses are clean but not huge, with courteous drivers. Perfect! Plus it got me down there just in time for an early dinner with his co-workers E&M, who met us at a new place not too far from the capitol. Called Word of Mouth Neighborhood Bistro, it's owned by Steve and Becky Mucha, who opened it in mid-December. Everything is made from scratch, and bread is sourced from Cascade Baking Co. (a great place for coffee and pastries downtown, btw) with produce coming from farms in the area as much as possible. Located in a sweet little bungalow just off busy State Street, it has the bustling charm of a hip mom-and-pop operation, which is exactly what it is. The menu is chock-full of comfort, from burgers (above left) and steaks to ribs and reubens, made just the way you remember them without any fancy frippery to get in the way. I was on my own the next morning and wandered out in the drizzle for a late breakfast to La Capitale, a newly opened brasserie that had been recommended by Luan and Tim from Foster & Dobbs as a good spot for a bite. Obviously still working on perfecting its French accent, the cappucino was a milky mess, but the Pain Perdue (top photo), brioche French toast with maple syrup and a poached pear compote, needed only a little more soaking in sweet custard to be a version worthy of some Gallic finger-licking. The drizzly afternoon was made a little sunnier by a trip to The Ram, a hangout for Salem lobbyists and Willamette University students for decades, a tav that makes a decent brew with bar snacks and burgers. Which left me wondering: With the legislature now going to annual sessions and a beautiful physical setting on the banks of the Willamette, will Salem finally step up and become a desirable destination, as well as a more interesting place for the folks who live there? Details: Word of Mouth Neighborhood Bistro, 140 17th St. NE, Salem; phone 503-930-4285. 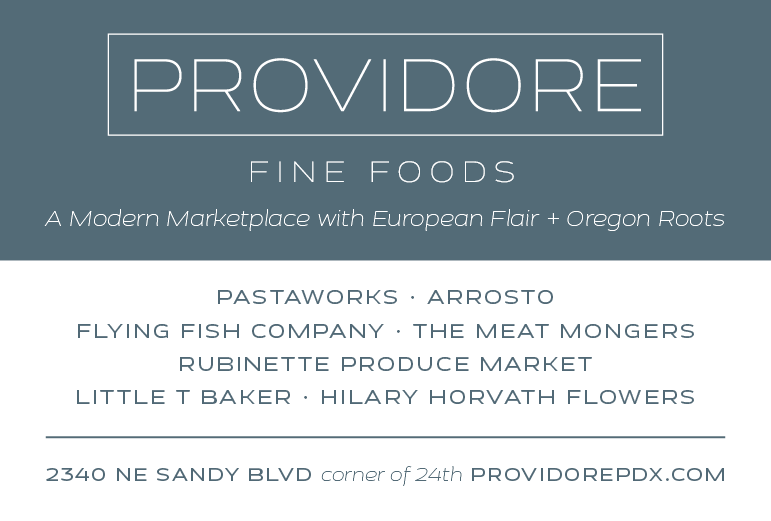 Cascade Baking Co., 229 State St., Salem; phone 503-589-0491. 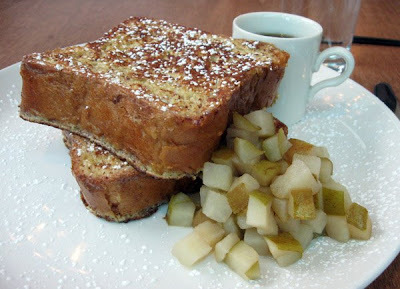 La Capitale Brasserie, 508 State St., Salem; phone 503-585-1975. The Ram, 515 12th St., Salem; phone 503-363-1905. It was shocking, actually. And the person who said it was in a position to know. It was at the recent Organicology conference, during a panel discussion on managing the threats posed by genetically engineered crops. “The dirty secret of the organic seed industry is that seeds are getting contaminated (with genetically modified organisms or GMOs) and are getting sold to growers,” said Matthew Dillon, director of advocacy for the Organic Seed Alliance. In other words, farmers and gardeners may be unwittingly buying GMO-tainted seeds when they think they’re buying an organic, and thus non-GMO, product. These same farmers may be selling their crop to companies (like food processors) that test for GMO presence and so their crop will be unmarketable, he added. Plus there’s the fear, as happened with a canola farmer in Canada named Percy Schmeiser, that Monsanto might sue them for illegally planting the company’s patented genetics. The protection of organic crops also depends on the active participation of conventional growers. “People who grow commodity crops don’t have a lot of time to do management of their crops and they get sloppy,” said Frank Morton of Wild Garden Seed. And the large scale of commodity growers swamps the smaller plantings of most organic growers. The difficulty is multiplied when organic growers depend on insects and pollen in the environment to grow their crops, since insects might have a range of one to three miles and wind-blown pollen can fly from one-and-a-half to six miles. And in a cramped environment like the Willamette Valley, it means that keeping crops free of contamination becomes next to impossible without strict oversight. The impact of contamination on organic farmers can be devastating, from rejected shipments to a loss of premiums and, worst of all, the erosion of confidence on the part of consumers. The solution, according to Ken Roseboro, editor of the Non-GMO Report, is to establish enforceable standards in the industry based on strict thresholds and verification. 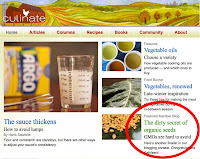 This post won the Culinate.com editors' award in the "Almost Spring Blogging Contest" as the post of the week! Thanks, guys! I know, I know, it sounds like a joke. Meatloaf, at least when we were growing up, was something cheap that would feed a family. My mom, though admittedly she would come home from a full day of work and actually cook, would throw one together with fatty hamburger, ketchup, an egg and some bread crumbs. Then she'd bake it in the oven until it resembled something you might find on the forest floor and wonder what it had been when it was alive. The meat mix, ready to be loaded with fixin's. It wasn't until I made one of the recipes in The New Basics Cookbook that I had my meatloaf epiphany. It didn't have to be a flavorless slab that resembled thick cardboard! It could be juicy and rich and delicious, something you actually look forward to having the next day in a sandwich. Like I said, a life-changing realization. So when my meat-loving friend Kathryn and her equally carnivorous husband were scheduled to come for dinner, it was the perfect excuse to make a meatloaf stuffed with prosciutto and spinach from Mario Batali that I'd seen on my brother's blog. It's definitely a "company" type of meal, though, since the prosciutto and cheese push it beyond our budget for weeknight meals. Rolled and heading for the oven. It has inspired some thought on how to make it fit into the Budget Cuts category, but until I work that out this will draw raves from your guests! 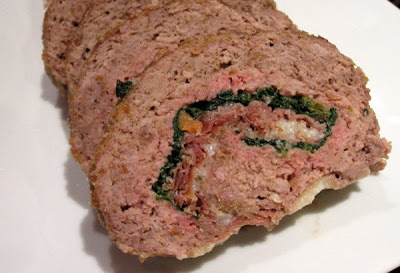 From Food and Wine: "This luxurious yet easy take on classic meat loaf gets stuffed with spinach, carrots, prosciutto and cheese. The vegetables can be leftovers, says Batali: 'Just make sure they're cooked long enough to be very soft—if they're al dente, the meatloaf will tear when you slice it and wreck your day.' Mild and tangy caciocavallo cheese, made in Italy from cow's milk, is excellent in the filling, but provolone is a fine substitute." Line a work surface with a 15-inch-long sheet of plastic wrap. In a bowl, mix the flour with the remaining 1/2 cup of bread crumbs. Sprinkle half of the crumb mixture all over the plastic wrap. Transfer half of the meat loaf mixture to the plastic and press it into a 12-by-10-inch rectangle, about 1/2 inch thick. Lay half of the spinach leaves over the meat, leaving a 1-inch border on the short sides. Arrange half of the carrots over the spinach, and top with half the prosciutto and sliced cheese. Starting from the long end of the plastic wrap closest to you, tightly roll up the meat loaf, tucking in the filling and using the plastic wrap to guide you; discard the plastic. Repeat with another 15-inch sheet of plastic and the remaining bread crumbs, meat mixture, spinach, carrots, prosciutto and cheese. Drizzle each meatloaf with 2 tablespoons of oil. Put the rosemary sprigs in the bottom of a broiler pan and pour in the red wine. Cover with the broiler pan grate. Set the meat loaves about 2 inches apart on the grate. Bake in the center of the oven for 40 minutes. Turn the broiler pan around and pour the water through the grate. Continue baking for about 35 minutes longer, or until an instant-read thermometer inserted in the center of each meatloaf registers 155°. Transfer the meat loaves to a carving board and cover loosely with foil. Discard any cheese from the bottom of the pan and strain the pan juices into a small saucepan. Boil the pan juices over high heat until reduced to 1 cup, about 5 minutes. Pour into a serving bowl and season with salt and pepper. Using a serrated knife, slice the meat loaves 1 inch thick and serve, passing the pan juices at the table.